AP-83-60039 vinyl L-step marker, right self-adhesive pack of 15 1 in. x 8 in. AP-83-60037 aluminum L-step marker, right foamy adhesive pack of 8 1 in. x 8 in. AP-83-60029 vinyl L-step marker, left self-adhesive pack of 15 1 in. x 8 in. AP-83-60027 aluminum L-step marker, left foamy adhesive pack of 8 1 in. x 8 in. AP-83-60069 vinyl strip self-adhesive pack of 8 1 in. x 4 ft.
AP-83-60107 aluminum strip foamy adhesive pack of 8 1 in. x 4 ft.
AP-82-60107 aluminum door handle backing self-adhesive pack of 10 4 in. x 4 in. AP-83-60089 obstacle marking strip self-adhesive pack of 8 1 in. x 4 ft. In 2004, the NYC Department of Buildings published Local Law 26 which enforces a range of improvements for NYC multistory buildings, including photoluminescent requirements that are detailed in Reference Standard RS6-1. 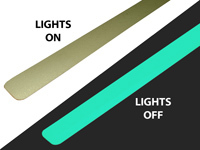 The 2008 New York City Building Code § 403.16 requires all new high-rise buildings to be provided with photoluminescent exit path markings (except exit paths serving Group R-2 residential apartment houses). Photoluminescent markings have to pass a minimum of five tests (brightness, washability, non-toxicity, non-radioactivity, surface flammability) to obtain an MEA (Materials & Equipment Acceptance) number. These photoluminescent products successfully passed these 5 plus two optional tests (rate of burning & UV resistance), confirming the superior performance of photoluminescent materials.